My husband is the master of stir-fry in our house. He cooked dinner almost exclusively when we were first married, and he still likes to cook and bake on the weekends. When I first saw it, I thought it was mapo-tofu. 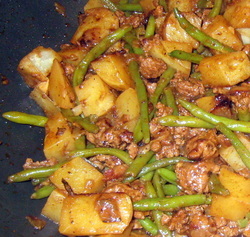 But it's ground lamb, potatoes, green beans and even some tomato paste thrown in. A good spicy one-pot-to-wash-and-done dish that my left-brain, electrical engineer husband approves because the taste vs. effort ratio is very high. The one slight inconvenience is the 1T of tomato paste. I don't use tube tomato paste and canned tomato paste comes is 6 oz. I got around this by freezing the rest of the tomato paste. Adapted from a Sunset Magazine recipe (Lamb keema with peas). This is where 'the process' is very important. Marinate the chicken in 2-3T of shoyu and all the ginger and sherry for about 15 minutes. In a small bowl, mix 2T water, the rest of the shoyu, cornstarch and Worcestershire sauce. Drizzle a wok or stir-fry pan with a bit of sesame oil and then a bit of canola oil. Make sure the wok is hot--the oil should swish and coat very smoothly. Add chicken with a bit of the marinade and stir-fry the chicken until just cooked. This will take approximately 3-5 minutes. Take the chicken out and put it in your serving bowl. Add a bit more sesame oil and then dump in the broccoli and stir-fry this until it has turned a very vibrant green. 2-3 minutes. If you need to add a tablespoon of water to quick-steam it a bit. Make sure the water is completely evaporated and toss the chicken back in. Add green onions, shoyu/Worcestershire/cornstarch sauce and red pepper flakes, and keep tossing the food. The cornstarch and heat will make the sauce thicken very quickly. Throw cashews in at the last minute and give it a few final stirs. Very good over Jasmine rice.